I haven't really knit a lot for my brother, historically. 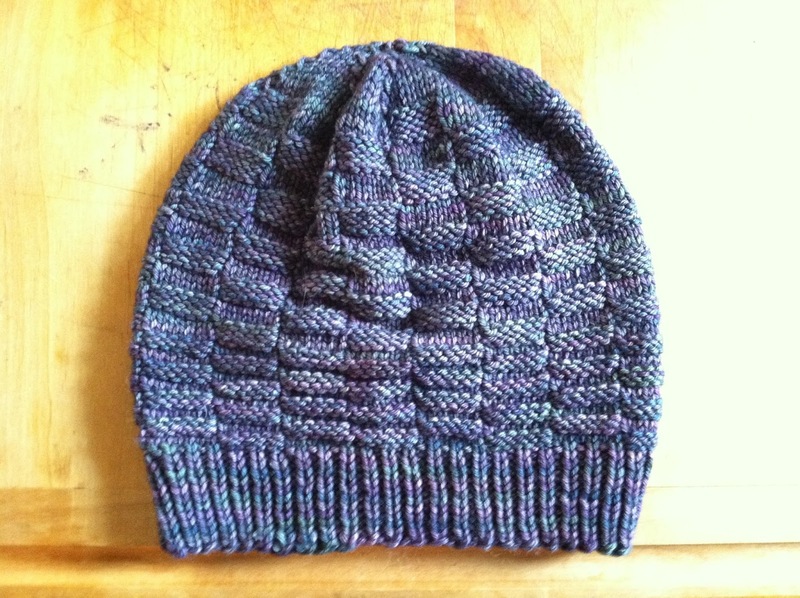 Back in spring, he asked if I'd knit him a hat. Not being one to squander any budding interest in knitwear, I sat him down right then and there to crawl through Ravelry and Knit Picks to get a plan. He decided on a classic look-the broken-rib beanie that is the Graham Hat. He kept with the classic theme by choosing a forest green tweed yarn, and then I promptly bookmarked both, and...didn't order the yarn for a while. Finally, I had an excuse to place a Knit Picks order, and I got his yarn. And...I left it in the box for a week or so. Finally, I managed to crank it out during a couple nights of play rehearsal, and I'm really pleased with it. I did make some mods-I changed the decreases at the top to be double decreases every other row, and I only did about an inch and a half of ribbing at the brim. But I really like how it came out, and my brother likes it too! Yarn: Knit Picks Wool of the Andes Tweed, "25448 Sequoia Heather"
It has been quite the week here-all I've managed to do in my newly-rediscovered free time is catch up on sleep and read! I haven't even done much knitting-I think I've only done a total of 12 rounds on a cowl since the play ended. Clearly, I need to finish catching up on rest and get back in the game. This weekend I'm finalizing the hat collection (I just realized I never told you all the collection's name-it's "Granite: Four Hats for Any Adventure"). I'm so pleased with how these patterns have turned out, and I can't wait to share them with you all! Just for a heads up, the collection will go live on September 1, so check back here on that date for the official release. The patterns will be available individually as well as in an ebook on Ravelry and on my Patterns page here. 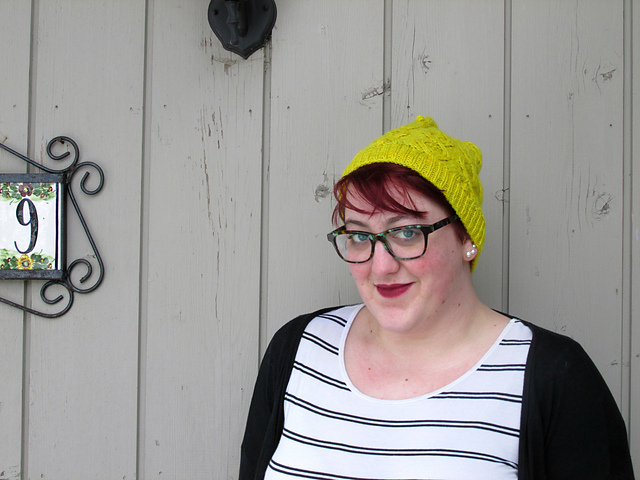 I'll be having my Birthday Sale in my Ravelry Store again this year, from 12:01am on September 1 through 11:59pm on September 9 (US Central Time), so all my patterns there will be 20% off if you use the code "HB25! "- I will also be doing a giveaway on my birthday of the entire hat collection, so be sure to check out the release here on September 1 to get more details about that! Wow, what an intense week! It was so much fun though, and the show came together so well. I am so proud of my community, this company, and every single cast and crew member who put all this heart and drive into the show. It really made it worthwhile, and we had such incredible, engaged audiences every night-a truly amazing show all around. Of course, I promised pictures! I juggled a few roles within the play: I started out as a statue of Queen Victoria, then I turned into a regular person, then I turned into a chimney sweep, and then back into Queen Victoria for the finale! First up, the statue makeup. That stuff gets everywhere, but it's super effective! Then my regular person costume-I have a pink plaid skirt as well, but note the fish brooch (my favorite part!!). And then as a chimney sweep! The makeup artist took advantage of the fact that she was just going to paint me grey again, and I usually ended up much dirtier than this. And, our big surprise for the show, we got Bert to fly as well! I had so much fun, and it really was an incredible, once-in-a-lifetime experience. I'm a tiny bit happy to have a regular bedtime again, but there are going to be a lot of parts of this show that I'm really going to miss. It's production week, and while I'm still getting plenty of knitting done, rehearsals are eating up all of my time. So I've decided to take a break from the blog this week-I'd been going back and forth about it the past couple of weeks, trying to decide if I could make it work, but it started feeling just a bit overwhelming, and that pretty much made the decision for me. Here's an idea of what my week will look like-lots of dancing, lots of rehearsal, four performances, and plenty of knitting to keep me sane :) I'll be back next week with a full recap-including Mary Poppins pictures! See you on the other side, and have a great week! 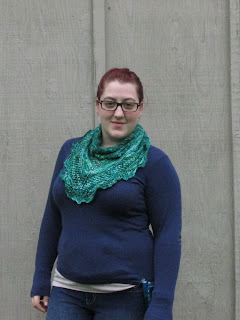 I've got a new shawlette pattern out this week! 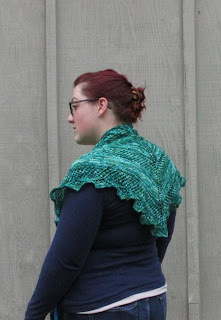 Nelumbo is a light, floaty shawlette, perfect for transitional wear. 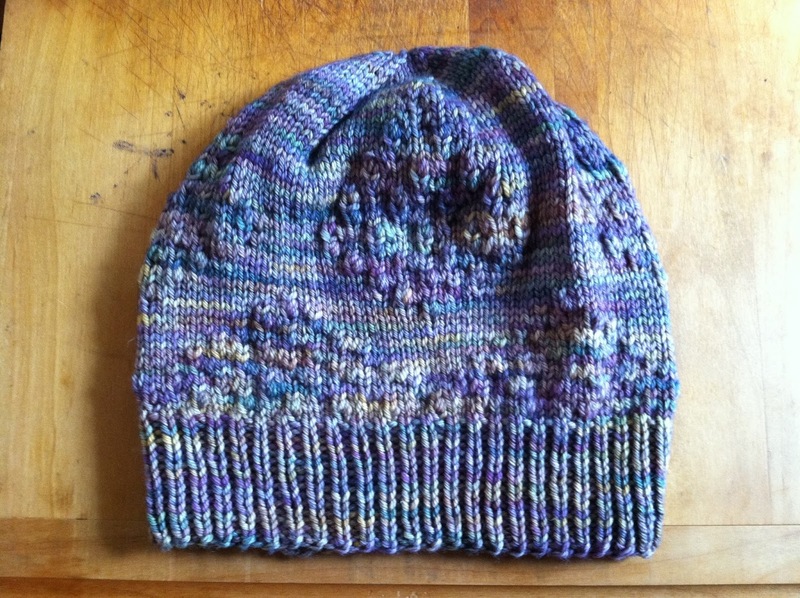 I designed it specifically for The Dyeing Arts Lush, which is a gorgeous 80/10/10 blend of Merino/Nylon/Cashmere. I was really inspired by this colorway, "Koi Pond," and tried to evoke water gardens in the design elements. The shawlette is basic top-down triangular construction, with alternating bands of stockinette, garter, and eyelet stitches. The whole thing is finished off with a lightly scalloped border. 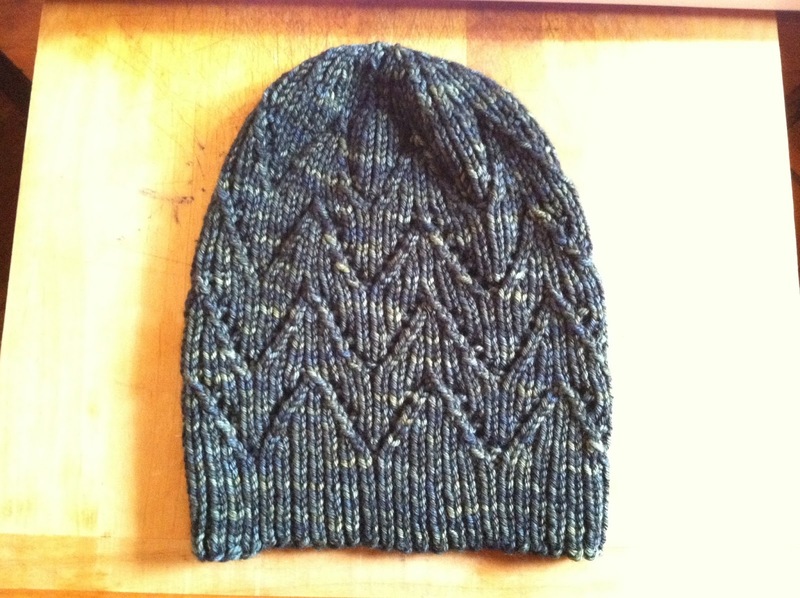 As always, you can get the pattern here or in my Ravelry store, but wait, there's more! In a partnership with The Dyeing Arts, Nelumbo is available as a kit! You can request a kit by visiting thedyeingarts.com. I'm fortunate enough that I can stock up on The Dyeing Arts stash a couple times a year in person-I absolutely love the fun sense of color, and the yarns are always a joy to knit with. I bought a car!! This is my first car, and I thought it was going to be the most valuable thing I own, until I realized that my insulin pump cost about 10 times as much as my car did. But whatever! I'm mobile now, and it's awesome. This is Priscilla, my 1992 Oldsmobile 88 Royale, and I am so impressed with her so far. She's got a couple of quirks, but her motor is fantastic. It feels like I'm driving a hovercraft. I can drive this car on the highway with the windows down without my hair flying everywhere. It's amazing. Right now most of my knitting is in the stage of "I promise it's getting bigger, even though it looks exactly the same." Which is tough for this blogger, because I don't really want to give you identical photos every day. Or a series of posts that all consist of "I've knit seven rounds on this cowl. Yes, it's still the same size," or, "The rows on this shawl are twice as long as they were a couple weeks ago, even though there's less than an inch of visible progress." So I'm really glad to have some actual, tangible progress for you today: I finally divided the sleeves for Mum's Rocky Coast! Not only is it finally starting to look like a sweater, but the body knitting is really coasting along now (see what I did there? I kill myself). Not surprising, given that there are 100 sleeve stitches total, and now I don't have to knit them anymore. 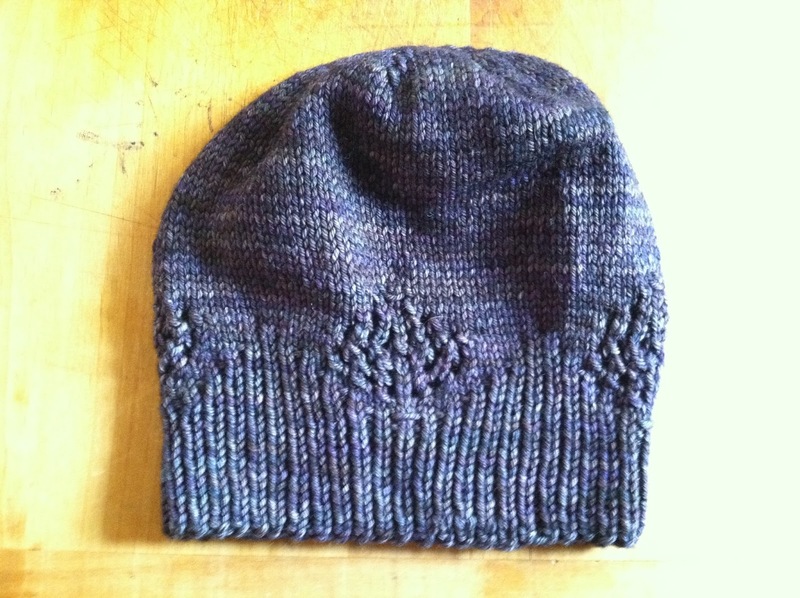 Plus, I don't have to keep track of things like raglan increases or integrating new stitches into cable repeats. It's just smooth sailing. Now, of course, comes the problem of it's going to get rather large rather quickly, and it's still hot enough that I don't feel like dragging a giant pile of wool around with me. But that's a problem for Future Kat. Well, it's been quite the weekend! Surprisingly, on a work trip I'm busy working, so I didn't get too much knitting done. I did manage to start the second ball of yarn for my lavender cowl, which is a sample for this fall, but that's pretty much it. I'm going to have to figure out something strategic for mum's Rocky Coast if there's any hope of her getting it for fall. I'm driving back home today, and I really can't wait to be back in my house with my family and my dogs. But it's been a pretty good weekend-all the work stuff went well, and I only got moderate acne, so yay! I've also been rocking flowers in my hair lately-I have a few headbands that I've recently started getting into, but this flower crown one is one of my favorites, and I also recently got some flower barrettes that I've been playing around with. So if I disappear, odds are I ran away to the forest to be a fairy princess.